Ever wanted to escape from it all, yet have the comforts of modern living? 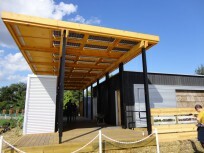 Appalachian State University built a house that has the best outdoor living space in the Solar Decathlon. The 1000 square foot deck has as much space as the 1000 square foot home. 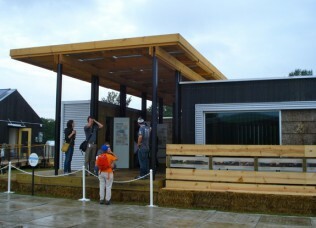 Seen with the ‘Great Porch’, Appalachian State University built a Solar Homestead for this year’s Solar Decathlon net-zero competition. The home is on the right hand side of the picture. Inspired by the pioneering spirit of those that settled in the Appalachian mountains, the project brings modern comfort to the idea of homesteading. 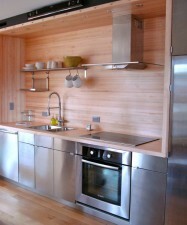 The home combined active and passive solar elements to power and make the home efficient and comfortable. The window on the dark grey building to the right side of the picture is a modified Trombe wall, a passive solar means of heating the home. 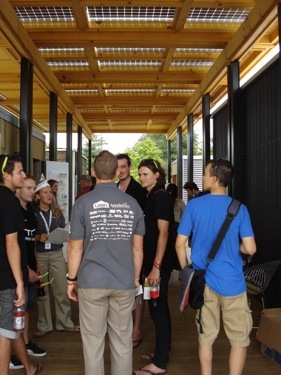 The team from Appalachian State University received the People’s Choice Award for their Solar Homestead entry into the 2011 Solar Decathlon. – How could they not with that great deck? 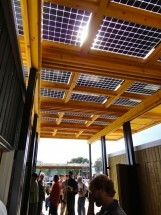 The deck space under the bifacial solar paneled canopy. It provides the home with both solar-based electricity as well as a shady, cool place to get work done or to simply entertain. This is not your average homestead. The canopy of the deck is comprised of 42 bifacial photovoltaic panels that can harvest solar energy – from both sides. The 195 watt photovoltaic panel / canopy can convert direct and reflected sunlight to produce energy. The canopy powers the Solar Homestead with a 8.2 kW system and produced an average of 36.9 kWh per day where Appalachian State University is based in Boone, North Carolina. The team handed out shiny, reflective hats with the ability to (potentially) increase their solar gain from the reflection. The team should get a marketing-educational award since the hat was wearable, shiny and reflective, but also doubled as a flyer that was filled with information. Many people, the students especially, continued to wear the hat throughout the day and into the other solar projects (and into the other photos). 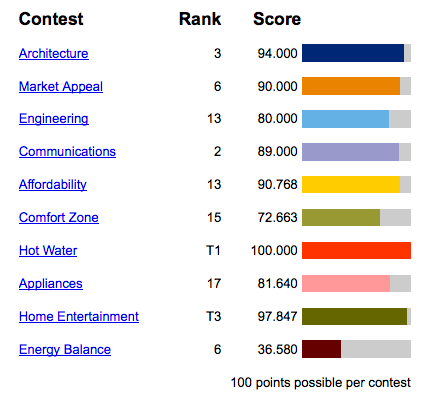 The team was awarded 2nd in the Communications and 3rd in the Architecture categories. Yes. It’s a Trombe wall that you’re looking at – in the window! 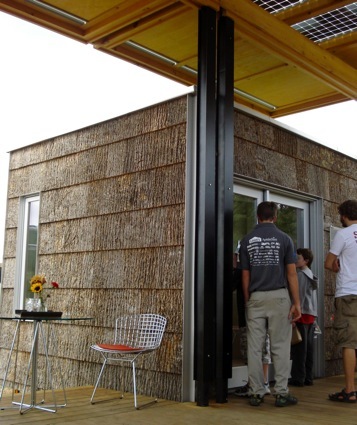 The Solar Homestead combined active and passive solar strategies with the use of a Trombe Wall, but it was a Trombe Wall unlike any other. 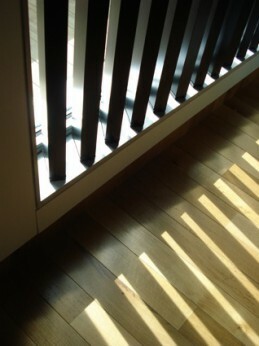 Upon entering the house, the kitchen / living / entertainment area, one sees that the modified Trombe Wall has vertical slats and allows light into the room. 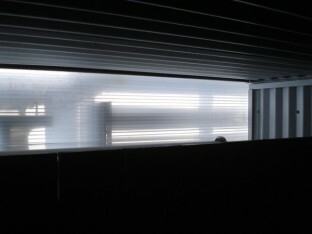 Students walk in front of the Trombe Wall – Window. The original concept of the Trombe Wall is one that can passively can heat the inner space of a building by absorbing the sun’s heat within a material, typically a type of masonry or concrete wall, that can later radiate the sun’s heat energy long after it was initially absorbed. The slats of the Trombe Wall-Window can be rotated to moderate light and heat. This Trombe Wall concept works similarly, but has been modified in a few ways. The material that absorbs the sun’s solar heat is rectangular shaped, with a metallic casing that has been painted black and filled with a plant-based oil mixture. The mixture is a phase change material (PCM) that becomes liquefied when it warms and slowly releases the heat through the cooler evening and night as it returns to a waxy solid material. Each rectangle can swivel so that it can absorb more or less heat. 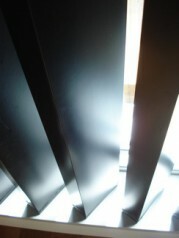 This action can also adjust the amount of light that enters the room. A sliding panel located on the outside of the home helps to insulate and keep warmth in the home after the sun goes down. 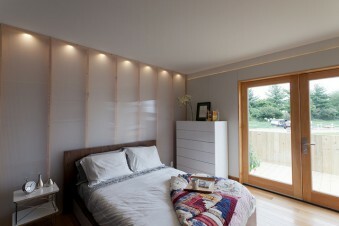 On a cold, cloudy day, the sliding panel can stay closed so that it provides more insulation that keeps the house warm. Similarly, if it is a hot summer day and the home does not to need any supplementary heat, the sliding cover stay closed. 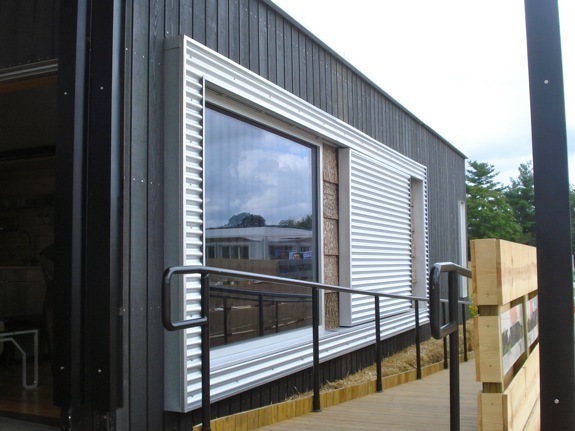 As a result, the Trombe window will not absorb the sun’s energy and the house will stay cool. 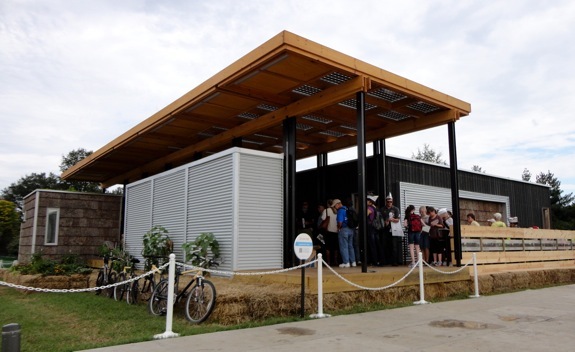 The actions of both the swiveling metallic bars and the outer insulating panel can be motorized, however for the Solar Decathlon, the team kept the process manual in order to keep costs down. 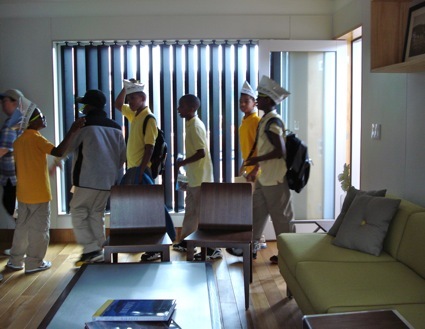 The students explained the various facets of the home throughout the tours. 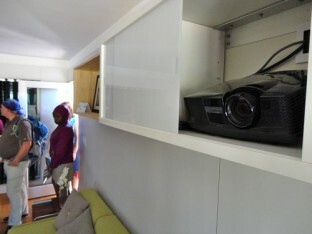 The Trombe Wall was located in the entry room that doubled as the kitchen and living / entertainment room. Not only did the kitchen have all the modern conveniences of the 21st century, but it also included a white projector screen that came down in front of the kitchen so that a digital projector located near the entryway could be used to project movies, shows or photos for entertainment. Both the couches and a dining room table were in the same room and it seemed comfortable and natural. Students designed all the furniture in this home. Students designed the all furniture throughout the home. They were modular and movable; functional, as well as aesthetically pleasing. I feel that students who design the furniture and artwork in the homes should receive some sort of extra accolades and/or points within a certain category. This facet of creativity may be factored into a category – say, architecture for instance, but I’m not sure if it is actually done. Two bedrooms were located along the eastern side of the house. 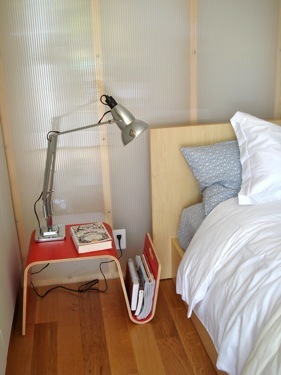 The translucent wall was lit by LED lights (light emitting diodes) to infuse light into the rooms at night. 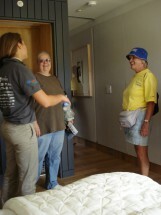 The students emphasized that care was taken to insulate the rooms for sound so that the noise of one room did not easily carry easily to the next. Sliding doors, also known as Pocket Doors were throughout the home. 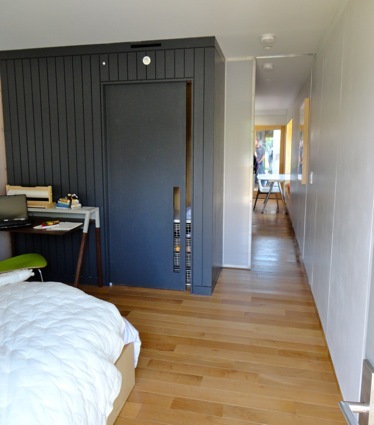 Both rooms had doors to access the outdoors on one side of the room while they could also be closed off from the rest of the house by a sliding door, also referred to as a pocket door. 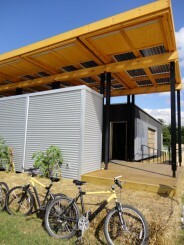 The main home’s roof had both a green roof section and solar implements. A green roof helps to keep the roof cool, as well as protects it from UV rays. The roof also hosted the thermal hot water tubes used to create solar hot water. 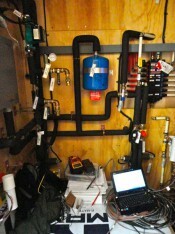 The bathroom, located in the core of the house next to the mechanical room, was lit by a skylight that showcased the hot water tubes. 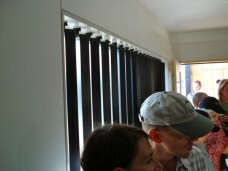 They can be seen in the photo gallery below. 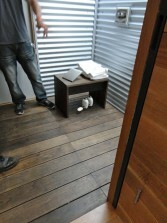 in addition to the sheds on the deck, there was one conditioned space, complete with a bathroom for a spare room. There were three outbuildings located along the deck. 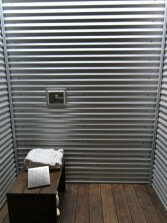 While a couple were used for storage, the one located on the northern side was a conditioned space that could be used as an extra room. 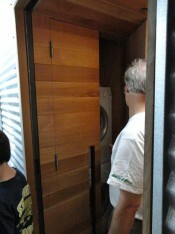 With a bathroom and outside washing area, it could serve as an extra guest quarters or perhaps mother-in-law quarters. 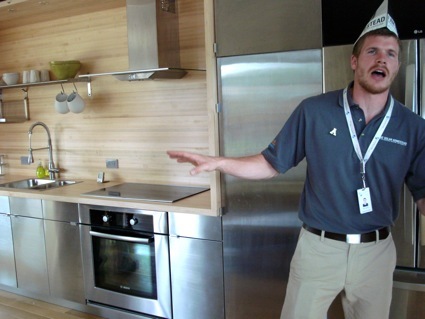 The Solar Homestead had a strong showing in this year’s 2011 Solar Decathlon. With over 92,000 votes cast, the entry from Appalachia State University won the coveted People’s Choice Award. This was also due to the continuous work from the team members as they explained facets of the home as they gave tours to visitors. 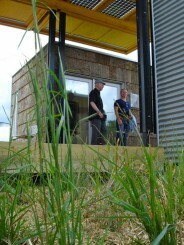 Appalachian State University is competing in the 2014 Solar Decathlon – Europe. Best of luck to the team. See other views of this house in the gallery and video below. Seen with the great porch, Appalachian University built the Solar Homestead for this year’s Solar Decathlon competition. The home is on the right hand side of the picture. 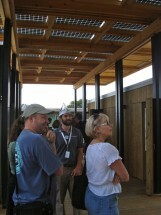 The deck space under the bifacial solar paneled canopy. 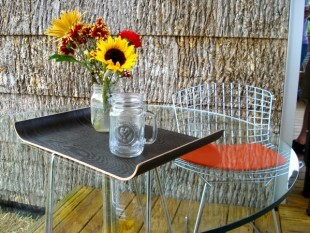 It provides the home with both electricity and a shady, cool place to get work done or entertain. The Trombe window was closed in the top photo, but is closed in this one. 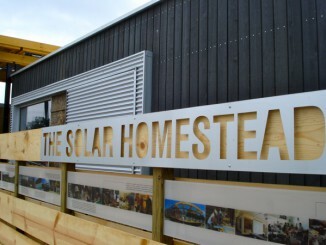 The Solar Homestead was estimated to cost $382,000 to build and finished 12th overall. A screenshot of the final scores for Appalachian State University, the crowd favorite. 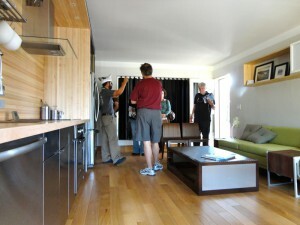 See the video of the Solar Homestead for more info.